In posts 1 and 2, we saw the romantic tale of William and Freide Feige, and the fading of William Feige from the story, and the appearance of Henry Van Dalsem into it. But the question still remains, what happened to William Feige? His paper trail leaves some idea of the answer to that question, although some details are sketchy. In Iowa, in September of 1882, he applied for an invalid pension about the same time he filed for the homestead land in South Dakota, a rather curious combination of events. In 1885, the Dakota Territory census shows him living on his homestead and his occupation was "farmer." He also had a hired man to help out. He and Freide still had five children at home. In November of 1887, significant things began to happen. This was almost exactly five years after filing on his homestead, having fulfilled the requirement to live on the land five years and to improve upon it. With that time being just barely completed, he appears to have sold the land to his wife for $1,000, and a land transfer notification was printed in the local newspaper. It was also about this time that his wife and children moved to Huron. The month after selling the land to Freide, he was admitted to the soldiers home in Leavenworth, Kansas. Two years later (1887), the newspaper printed a notice that land patents were ready for pickup at the post office, and patent #1174 with William Feige’s name on it was among them. In June of 1894, he transferred from the soldiers home in Leavenworth to another soldiers home in Dayton, Ohio. 1895 – I believe he was married to a woman named Sophia about this time, likely in Ohio. This is based on future documents. On June 26, 1897, he was discharged from the soldiers home “at request,” presumably his. I was unable to find him in the 1900 census, but I suspect he and Sophia (or just him) were still in Ohio. In 1903, he moved back to South Dakota, according to information provided in the 1905 SD state census. In 1905, William Feige appears in the South Dakota State Census, a resident of Campbell county, is 67 years old, and divorced. He lists his occupation as “minister.” He said he had been in the state for two years. In 1907 he was granted a military pension of $12 per month, with a second pension date of May 1912, at $22.50 per month. In 1910, he was an “inmate” at the State Soldiers Home in Hot Springs, South Dakota, was 71 years old and is married, and had been married for 15 years. The marriage information is inconsistent with this status as “divorced” in 1905. In 1915, he again appears in the South Dakota State Census, age 77, living in Fall River county at the Soldiers Home in Hot Springs. No occupation is listed. His Civil War service is referenced, and he is not “blind, deaf, insane or idiot.” No marital status is noted. Leavenworth paperwork indicates that it was his daughter-in-law, Mrs. Carl Feige, who was notified of his death and who received his personal effects, in lieu of William’s son Carl, who was serving in the military. William’s pension payment card notes the date of his death, and that money was payable to his widow, Sophia Feige, Willow Wood, Ohio. The widow applied for a pension based on his service in September of 1925 and filed from Ohio. While these facts help paint some sort of a picture of William’s life after his divorce from Freide, the most interesting questions remain unanswered. Why did William and Freide Feige divorce? Did his medical status have something to do with it? Was this common knowledge among the citizens of Huron, or did they really believe he had died? Almost exactly five years after filing the homestead claim, the land was sold to Friede and William moved to the soldiers home in Kansas, almost as though he/she/they were waiting to have full rights to the land before making any moves. Was this a plan involving both William and Friede? Did William’s second wife Sophia ever accompany him to South Dakota or Kansas? If not, why? Why did William’s daughter-in-law get notification and his personal effects after his death, and not William’s widow? Without a doubt there is much more to William’s story, and the most interesting parts of it may already be lost to history. “Pioneer Huron Woman Doctor Poses for Picture Showing 5 Generations.” The Evening Huronite (Huron, South Dakota). 18 May 1936, pg. 9. “Proceedings of the Board of Commissioners, Beadle County, South Dakota.” The Daily Plainsman (Huron, South Dakota). 01 Aug 1907. The Dakota Huronite (Huron, South Dakota). 22 Jul 1909, pg. 5. Short local news items. “Observes Ninetieth Birthday.” The Evening Huronite (Huron, South Dakota). 06 June 1934, pg. 6. “Do You Know.” The Evening Huronite (Huron, South Dakota). 29 May 1928, pg. 6. “Grow Old Along With Me.” The Evening Huronite (Huron, South Dakota). 21 May 1929, pg. 6. Classified Ads. The Daily Plainsman (Huron, South Dakota). 06 Sep 1893, pg. 4. Lost Pocket Book. Claims submitted to County.The Daily Plainsman (Huron, South Dakota). 14 Aug 1894, pg. 4. Van Dalsem & White printing equipment. The Daily Plainsman (Huron, South Dakota). 07 Mar 1895, pg. 4. “Without the Huronite!” The Daily Plainsman (Huron, South Dakota). 23 Nov. 1894, pg. 4. “In Memoriam.” The Daily Plainsman (Huron, South Dakota). 30 May 1928, pg. 12. “A Valuable Book.” The Daily Deadwood Pioneer-Times (Deadwood, South Dakota). 17 Nov 1916, pg. 2. “Poems of Soul and Home.” Lead Daily Call (Lead, South Dakota). 18 Nov. 1916, pg. 2. “City Briefs.” The Evening Huronite (Huron, South Dakota). 17 Jul 1929, pg. 6. “Buy Liberty Loan Bonds, She Says.” Aberdeen Daily News (Aberdeen, South Dakota). 4 Jun 1917, pg. 1. “Huronitems.” The Daily Plainsman (Huron, South Dakota). 10 May 1892, pg. 3. Birth Announcement. The Daily Plainsman (Huron, South Dakota). 29 Sep 1890, pg. 4. “Real Estate Transfers.” The Daily Huronite (Huron, South Dakota). 14 Nov 1887, pg. 3. “Land Patents.” The Daily Plainsman (Huron, South Dakota). 08 Aug 1889, pg. 2. Child kicked by horse. The Daily Plainsman (Huron, South Dakota). 20 Jul 1893, pg. 4. Called to Highmore. The Daily Plainsman (Huron, South Dakota). 02 Aug 1889, pg. 4. “Birthday Dinner for Dr. Van Dalsem.” The Daily Plainsman (Huron, South Dakota). 06 Jun 1930, pg. 6. “Do You Know.” The Evening Huronite (Huron, South Dakota). 25 May 1928, pg. 5. “Dr. Van Dalsem Celebrates Birthday.” The Daily Plainsman (Huron, South Dakota). 08 Jun 1933, pg. 5. “Pioneer Days.” The Daily Plainsman (Huron, South Dakota). 29 Jul 1960. “Delinquent Tax List.” The Evening Huronite (Huron, South Dakota). 10 Dec 1937, pg. 8. “City Briefs.” The Evening Huronite (Huron, South Dakota). 16 Apr 1934, pg. 7. “Twenty Years Ago Today in Huron.” The Evening Huronite (Huron, South Dakota.) 20 Apr 1933, pg. 6. “Celebrates Birthday Quietly Tuesday.” The Evening Huronite (Huron, South Dakota). 9 June 1932, pg. 6. “Celebrate 56th Wedding Day Saturday.” The Evening Huronite (Huron, South Dakota). 09 Mar 1931, pg. 5. “Dr. Van Dalsem Has Guests.” The Evening Huronite (Huron, South Dakota). 31 Mar 1931, pg. 6. “City Briefs.” The Evening Huronite (Huron, South Dakota). 08 Jul 1930, pg. 5. “Twenty Years Ago Today in Huron.” The Evening Huronite (Huron, South Dakota). 04 Dec 1929, p. 14. “Entertains for Out-of-Town Guest.” The Evening Huronite (Huron, South Dakota). 17 Jun 1930. Pg. 6. 1870 Federal Census, Sedalia, Pettis county, Missouri. 1880 Federal Census, Eden twp., Sac county, Iowa. 1885 Dakota Census, Beadle county, Township 112 N. Range 61. 1890 Veterans Schedule, Wisconsin, Chippewa county, Village of Bloomer. 1895 South Dakota State Census, Beadle county, Huron, 2nd Ward. 1900 Federal Census, South Dakota, Beadle county, City of Huron. 1905 South Dakota State Census, Beadle county, Huron. Card for H. A. Van Dalsem. 1905 South Dakota State Census, Campbell county, PO Artas. Card for Wm. Feige. 1910 Federal Census, South Dakota, Fall River county, Hot Springs. 1915 South Dakota State Census. 1920 Federal Census, South Dakota, Beadle county, City of Huron. 1925 South Dakota State Census. 1930 Federal Census, South Dakota, Beadle co., City of Huron. 1907 Huron City Directory, listing of Physicians, p. 135. Home listing pg. 108. 1930 Huron City Directory, listing of Physicians. John M. Comstock, “The Congregational Church of Vermont and Their Ministry,” pg. 87. William Phipps Blake, “Centenary of Hamden, Connecticut,” pg. 197-198. O. W. Coursey, “Literature of South Dakota,” pg. 186. United States Veterans Administration Pension Payment Cards, 1907 – 1933. 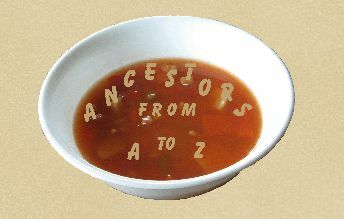 FamilySearch.org. Card for William Feige. U. S. National Homes for Disabled Volunteer Soldiers 1866 – 1938, Leavenworth, Kansas. FamilySearch.org. Military Enlistment record, Henry A. Van Dalsem. Veterans Burial Records, William Feige. Iowa, Deaths and Burials (Ancestry.com). Death of Sarah L. Van Dalsem. Find-A-Grave gravestone photo for Henry and Freide Van Dalsem, courtesy of Brenda Behlke. 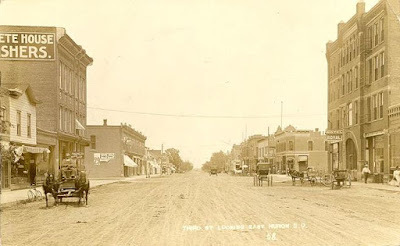 Our story left off in Part 1 in 1887-88, when Freide and her children moved from their homestead in Beadle County, Dakota Territory, into the nearby town of Huron. One source claims she moved to the current site of the Marvin Hughitt Hotel building, and later moved to 319 3rd St. SW. Her home initially served as her office as well. In 1894, she married Henry A. Van Dalsem, a local publisher. Just who was Henry Van Dalsem, and how did he come to be in Huron, South Dakota? Henry was born in New York in 1842. He married Sarah Lindley Thomas, and at age 20, he enlisted for service during the Civil War, in Albany*. 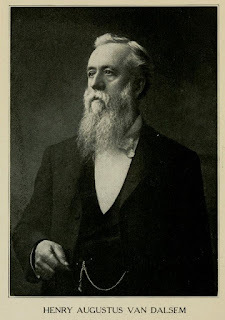 From 1873-74, he served as a Congregational Church minister in Hamden, Connecticut; in 1880 he was an editor in Fairfield, and shortly afterward returned to the ministry in Pomfret, Vermont until 1887. The Van Dalsems, like the Feiges, had eight children in all. By 1890, he had moved to Bloomer, Wisconsin. Since his wife and children appear in Wisconsin (sans Henry) in 1900, they are probably with him at this time as well. ** For whatever reason, the Van Dalsems were divorced, and it appears that Henry left them behind when he came to South Dakota. Henry Van Dalsem was in Huron by 1892, working as a partner in the Van Dalsem and White publishing firm, and married Freide Feige two years later. Van Dalsem and White publishing house may have faced an uphill battle from the beginning. This era of newspaper and publishing work appears to have been a rough one for anyone trying to be successful in these vocations. What little reading I have done on the subject suggests that newspapers were commonly used as pawns in political fights, and editors needed to write editorials that backed the groups that kept them financially afloat, whether or not they were personally in agreement. A newspaper article in the Daily Plainsman (Huron) reprints an article from the Redfield (South Dakota) Journal-Observer, and points out that Huron is never without drama regarding its newspapers. Around the time of his business’s demise, he married Dr. Feige. Over the next 20 years, he had various occupations including notary, working for an employment agency, an account collector, and interestingly, considering his previous looting charge, a judge. But his real passion and calling appears to have been writing. He wrote editorials for “The Ruralist,” created writings for a fraternal organization, and authored scholarly addresses for a variety of organizations. And after his death, his widow published a well-respected volume of his poetry and prose. Henry passed away on December 1, 1913, and left instruction with his wife and friends regarding his wishes. One of them, ironically, illustrates his apparent disdain for organized religion. Dr. Freide Feige Van Dalsem was a pioneer in many respects, and it’s hard to imagine anyone working harder than she. As a physician, she called on sick and injured patients day and night, both in town and miles away from town in every direction, including the town of Highmore, nearly 70 miles away. Most of her early travel was done on horseback. 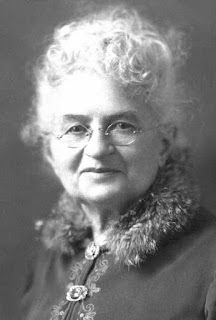 She performed services for Beadle County, in 1907 being paid by them for attending to 25 births and one death, a total of $6.50, or in total’s labor value, about $1,150. * The county certainly got their money's worth out of Dr. Freide. Freide was one of ten physicians in Huron, and the only female. By 1930, as her practice was winding down, there were more physicians but she was still the only woman in the ranks. But she was hardly a glorified midwife. Newspaper accounts record her involvement as attending physician in everything from accidents, farm mishaps, and even a prominent family with diphtheria. One of the last newspaper accounts of her medical practice was in 1931 when she attended to the birth of yet another young Huron citizen. At that time she was 84 years old. Besides tending to the sick and injured, she was a frequent speaker for many groups on various topics. She herself was involved with the Homeopathic Medical Association, the National League of Women Voters, her local Presbyterian church, Eastern Star, the Rebekahs, and the Relief Corps. She was also a landlord, owning “considerable property” including at least two homes, one garage she rented out, and the land she had homesteaded with her husband, Rev. William Feige. After the death of her second husband, one of her sons and his wife made their home with Dr. Van Dalsem at 1219 3rd St. SW. This son, along with another son and Freide all died within the same year, 1937. Notwithstanding a complicated personal situation, Dr. Van Dalsem made a huge contribution to the burgeoning town of Huron and its residents, and was an inspiring example to women who desired uncommon roles in life. *Interestingly, William and Freide Feige were in Albany at this same time, where William also enlisted, and where he also pursued ministerial opportunities, but I found no indication of whether or not they knew each other. **The 1890 Veterans Schedule does not list anyone other than the veteran himself. It was a tale of intrigue, romance, and secrets. It was also a tale of female pioneer strength and of community service. But if you were going to categorize it, you'd have to call it a mystery. There was something different about Freide Werner from the time she was a child. The daughter of a minister in Bitterfeld, Saxony, her intent desire was to become a doctor, but it was unheard of for a young woman in 1850s-era Germany to be accepted into any medical school. Her father was no stranger himself to traveling the hard road – he was the first Baptist minister in an area where Baptists weren’t particularly welcome, but he persevered. He arranged for his daughter to study medicine privately with Dr. Lautze, who himself had studied under Dr. Samuel Hahnemann, the founder of homeopathic medicine. Meanwhile, as Freide tended to her studies, young Captain William Feige, stationed at Magdeburg, was being transferred to the town of Bitterfeld. He boarded next door to the Werner family, and 15-year-old Freide caught his eye. While just 20 years old himself, he approached Freide’s father asking for her hand in marriage when she became of age, and her father accepted the proposal – all without Freide’s knowledge or consent, and the notion of being married did not go over well with her. However, Capt. Feige was “charming, highly educated, and handsome” – and over the course of the next three years, she warmed up to the idea. However, Capt. Feige’s family did not. Vehemently opposed to the engagement, the Feiges, who had ties to the Prussian royal family, had made other marriage arrangements for their son. After their wedding, William and Freide had to immediately board a ship bound for America to escape the fallout. The year was 1862, and the newlyweds made their first home in Albany, New York. William was interested in preaching and missionary work, and took that as his vocation. Freide meanwhile, gave birth to their first child in 1863. When the call went out for soldiers to defend the Union, William answered. He sent his wife and daughter to German friends in Missouri. While awaiting the end of the war, Friede began providing medical services to those in need. While Freide tended to the sick in Missouri, her soldier husband was having his own health problems. In April of 1865 during the Battle of the Wilderness in Virginia, he became ill from an unknown malady, and like so many other soldiers, afterward suffered from chronic diarrhea as well as rheumatism. He would never again be the same. After the war, William went to Missouri to fetch his wife and family, and they lived in various other communities in Missouri and Iowa. For a while, he worked as a teacher. But his religious calling moved them to Marengo, Iowa, where he worked as a preacher and Freide built up a rather large medical practice. 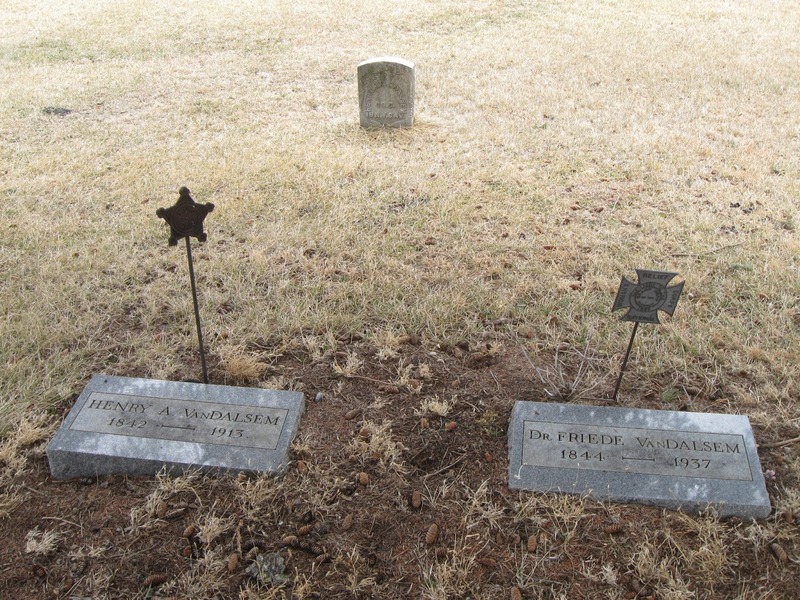 By this time, Freide’s parents, brothers and sisters had also come to America. After Marengo, it was Sac county, and then Spirit Lake, where William was called to be the first pastor in a newly-organized church. They spent four years there and had a total of eight children, and then William had a strange idea. He decided to be a farmer. Not such a strange idea in and of itself, but factor in that neither of them knew the first thing about farming, and William was dealing with a disability, and it becomes a rather curious notion. Perhaps his disability clouded his thinking, or perhaps he overestimated what he was able to do. He took up a claim in Dakota Territory, in Beadle county in late 1882 and moved his family there in February of 1883. Freide had saved some money from her medical practice in Iowa, and it was enough to build a small house for the family of nine. She did much of the lathing and plastering with her own hands, when she wasn’t busy with the children or tending to sick patients. Despite being new to the area and people, her medical services out on the prairie were in demand, day and night. The roads were often poor, or there were no roads at all; and typically she made her house calls on horseback. At night she used a compass, or tried to follow the railroad tracks to keep from getting lost. With the exception of occasional preaching, William was unable to work much once the family moved to the homestead, so Freide’s medical practice became vital not only to her patients, but to her family as well. And then, her story takes a turn. There is curiously little written about her personal life during this time. One biography, however, mentions that she was “left a widow.” She and her children moved into nearby Huron and she went on to marry Henry Van Dalsem, a local publisher. The Widow Feige was beginning a new chapter in her life. There was only one problem.